I am a Christian myself, and I'd just like to say that's a horrible idea. @WickedStyx, nice clarification, that could have gone badly. @WickedStyx, I'm glad some one said it. @Prince super Vegeta , so Germany, Japan, and Italy are now a church? @Prince super Vegeta , Aquarius? As much as I agree to that being *bird person voice* a djck move, it does not automatically mean that all Christians are cvnts. But that one person - yes. Do you want to get smitten? Because that's how you get smitten. @Half Black Man, unless you're talking about falling in love, I think you mean smote. @Sybil Reisz, Nope. You would in the sentence "He smote you" but not "he was smitten". A pattern common throughout English. @Vault Tec, I would understand if someone uses it as a tip for someone in food service or something, but they left it on the ground out in public. What's so wrong with that? @Dweeebus, Don't trick people with fake money like that. If your going to advertise your church or religion do it in a non-tricky way. This wouldn't make me go to that church or look more into the religion. If somebody genuinely talked to me about it or something of the sort then yes I'd think about it. But this would just make me mad that they were going to that length for it. 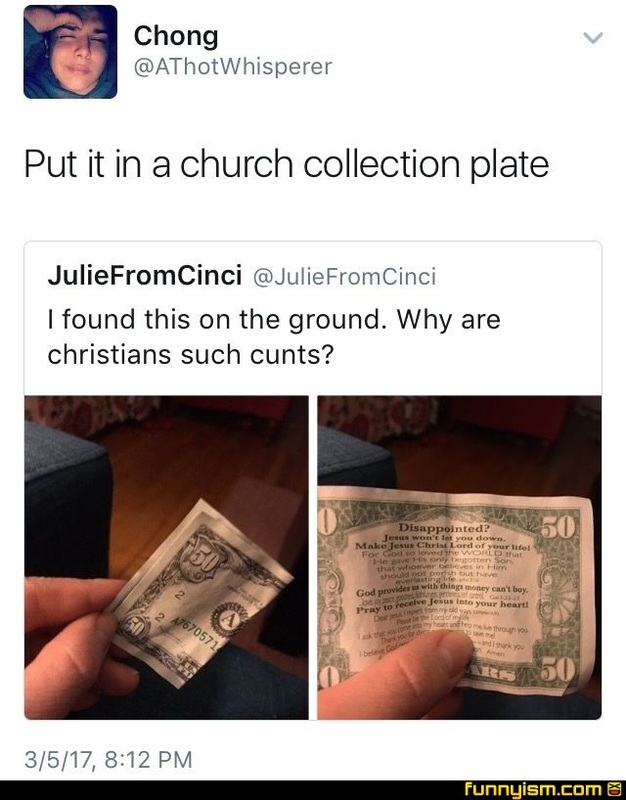 @Dweeebus, well why not put it back in the church offering bucket? I could use pretty much your same argument for that. @Juggy, please don't! I am looking forward to hang out with all the strippers and fun people in hell, so please don't try to direct them to salvation. I dunno, sounds like they were going to spend someone else's money they found. That's not a nice thing either. That would require someone having to go into a church. It rather just mail it in. @Dweeebus, There's nothing endearing about bullsнit indictrination. The whole bunch on this side of religion, Yaaa, Look at history, not so great for everyone. But us we got off good for being a$$h0les. God: all-knowing, all-powerful, but still can't handle money. Just remember, he loves you. He loves you, and he NEEDS MONEY. If it wasn't a Christian thing everyone would think it's hilarious. It is hilarious. I'm an agnostic and I think that it's a good thing. It's easily better than God-bothering at a stranger's doorstep. Also, mind you, they're not typically trying to be assholes. They're trying to save you, or at least they believe that they are.